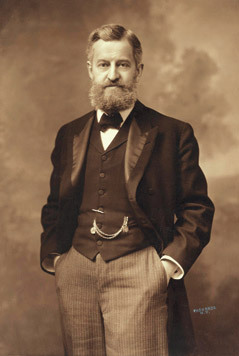 A great irony of the authorship movement is that Henry Clay Folger, founder of the Folger Shakespeare Library, was very likely an Oxfordian sympathizer. He took such keen interest in J. T. Looney’s 1920 identification of Oxford that, in 1925, he bought the Geneva Bible that the earl himself had purchased three and a half centuries earlier in 1570. De Vere’s copy was quietly ensconced in the Library when it opened in 1932, two years after Folger’s death. There it remained, unheralded, until 1992, when two Oxfordian researchers, Dr. Paul Nelson and Isabel Holden, learned it was being guarded by folks with powerful reasons to keep its contents under wraps. Those contents were explosive: more than a thousand marked and/or underlined verses, apparently in Oxford’s own hand, with plenty of links to the Shakespeare works. Enter Roger Stritmatter, who would pore over the handwritten annotations in Oxford’s bible (often in partnership with Mark Anderson) for the next eight years, eventually earning his Ph.D. in Comparative Literature at the University of Massachusetts at Amherst. 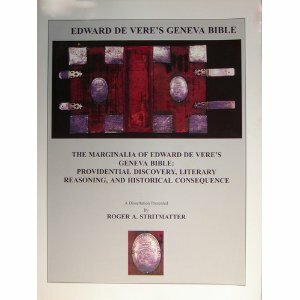 Dr. Stritmatter’s 2000 dissertation, The Marginalia of Edward de Vere’s Geneva Bible, stands as both a remarkable achievement in scholarship and a landmark event in the history of Shakespearean authorship studies. It is also a powerful demonstration of insights and connections that become possible when the correct biography of “Shakespeare” is brought into alignment with historical documents. In 1929 Esther Singleton published Shakespearian Fantasias: Adventures in the Fourth Dimension, with stories based on characters in Shakespeare’s comedies. Having apparently read Shakespeare Identified by Looney, she introduced Oxford as Berowne of Love’s Labour’s Lost, Jacques of As You Like It and Benedick of Much Ado About Nothing. Folger found these tales so delightful that he bought at least twenty copies of the book to give to friends; just before he died, he also negotiated with Singleton to buy her original manuscript. Singleton died only two weeks later, but her heirs eventually presented the manuscript to the Folger Library in her memory. Folger’s interest in the possibility of Oxford’s authorship was kept secret for decades. In the mid-1970’s, Folger’s had a traveling exhibit of some of its major Shakespearean finds, and I saw the Geneva Bible in Kansas City. Imagine my pleasure, after I had become an Oxfordian, to know that I had seen the original @ 15 years earlier. I would add to this the “weaver’s beam” allusion to the David and Goliath story…which appears in a Shakes-speare play (I forget which, just at the moment–cite, Hank? 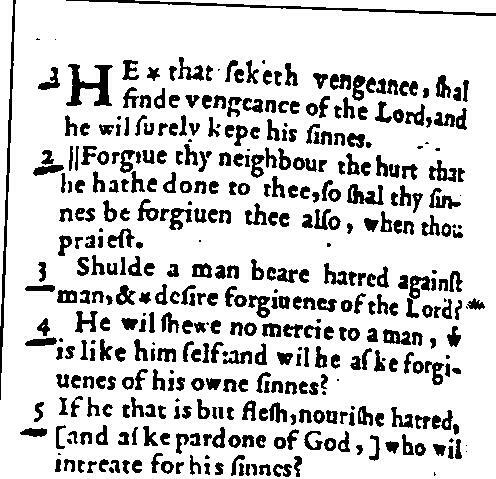 ), and is underlined in Oxford’s Geneva Bible. The odds of this being mere coincidence are astronomical, and for me, is as near to a ‘smoking gun’ as any man might believe, beyond a reasonable doubt. Hank, have you had a chance to read the new academic book, “A Brief Discourse of Rebellion and Rebels by George North: A newly uncovered manuscript source for Shakespeare’s Plays,” by Dennis McCarthy and June Schlueter? I ask here because in it they suggest that, to quote: “In terms of the number of plays, scenes, and passages affected, the scope of the manuscript’s influence likely exceeds all other known Shakespearean sources, excepting only the Chronicles of Hall and Holinshed and Thomas North’s Plutarch’s Lives”. That assertion gave me pause on a number of levels and I’m curious as to your thoughts about it.